If you are experiencing red eyes, itchy eyes or watery eyes it could be due to pollen-induced eye allergies. April is the start of pollen season, which means uncomfortable symptoms such as red eyes, itchy eyes, stinging, burning and watery eyes. Seasonal eye allergies are caused by the release of tree and flower pollen into the air and can greatly inhibit everyday functioning for those that suffer from them. How can you guard your eyes this allergy season? Get an early start. See your eye doctor before allergy season begins to learn how to reduce your sensitivity to allergens. Use plenty of artificial tears to wash airborne allergens from your eyes. 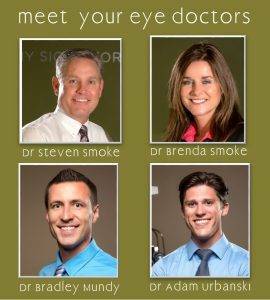 Ask your eye doctor which brands are best for you. Cut down your contact lens wear or switch to daily disposable lenses to reduce the buildup of allergens on your lenses. Whenever possible limit exposure to pollen by staying indoors, particularly when the pollen count is high. Keeping windows closed, using air conditioners and wearing full-coverage sunglasses when exposed to the elements can also help to limit exposure to allergens in the air. A HEPA (high efficiency particulate air) filter is also known cleanse allergens from the air inside your home or office. When you are outside a close fitting pair of sunglasses can help to reduce the amount of allergens getting to your eyes. Since most of us must go outside on occasion, there are medications that can reduce symptoms such as itchy eyes, red eyes or watery eyes. Often times a basic lubricating eye drop will moisturize and alleviate itchy eyes or red eyes and flush out allergens. Oral medications will alleviate irritation of the eyes as well as non-eye related symptoms such as stuffed or runny nose and sneezing. But, medicated eye drops are often recommended in addition because they can work better than oral solutions to alleviate eye problems. Some of our favorite eye drops are Zaditor or Alaway, these used to be prescription only but are now available over the counter. Contact lens wearers sometimes have worse symptoms from eye allergy season due to the fact that irritants can accumulate on the outer surface of the lens, bringing about an allergic reaction. This is compounded when oral antihistamines are taken which have a drying effect on the eyes. Contact lens wearers should take steps to ensure eyes are lubricated and replace lenses on time. Switching to daily disposable contact lenses can greatly reduce your allergy symptoms. If you are prone to allergies, try to prevent the release of anti-histamines early in the season by using and over-the-counter or a prescription eye drop prior to developing symptoms. Once the histamine–the agent that causes your symptoms is released by your body it is more difficult to gain control. If you suffer from allergies and have not been able to maintain comfort with OTC drops call us to schedule an appointment so that we can prescribe a prescription strength medication to help you be comfortable through this upcoming allergy season.